Professional capo for nearly all six and twelve string guitars with curved fingerboards. Attached and released with one hand. 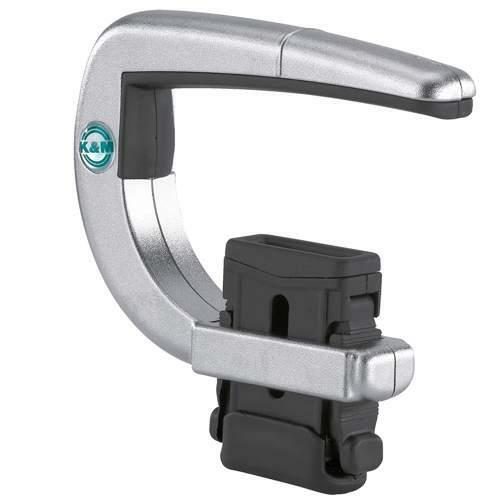 The capo's unique clamping mechanism is quick to attach to the guitar neck and just as simple to release. This is a quality zinc die cast model with rubber inserts. The parallel clamping mechanism means there is no "string bend" when attaching the capo, so tuning is not affected. Contact pressure is precisely adjustable and the ergonomic design makes for next-to-no interference while playing near the capo. No pre-setting necessary - simple and quick to mount on other frets.